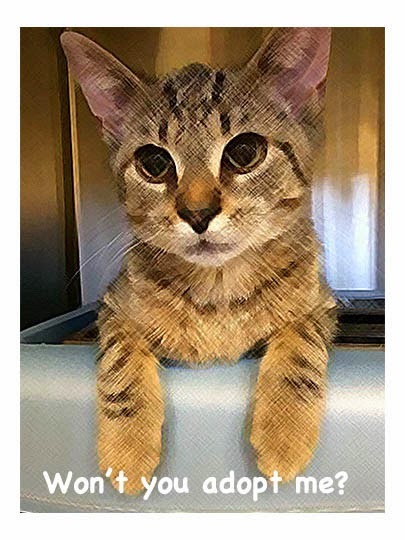 June is Adopt a Shelter Cat Month so I’m giving shout outs to some special needs kittehs that are still locked up in the local jails animal shelters through no fault of their own. I was rescued from a kill shelter only to be sent to another shelter where I waited a long time to make my break. Life ain’t easy for cats deemed to be less adoptable like I was. This week I'm featuring another one of Secaucus Animal Hospital's adoptable pets of the week. He was also featured on their FB page the week of May 15th so our boy has been waiting awhile for his forever home. 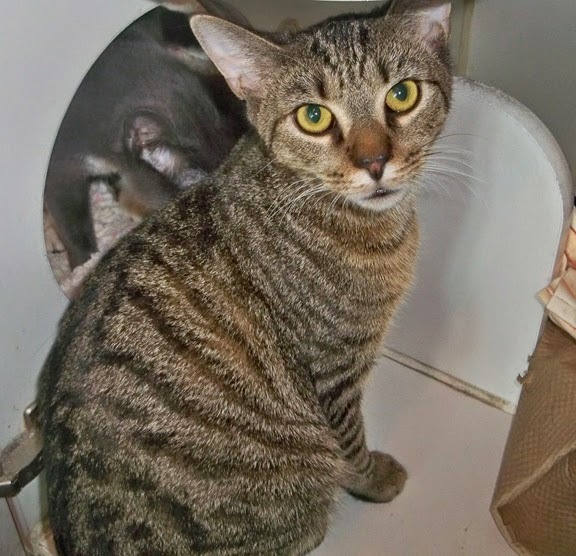 This adorable tabby boy is Bedford and he is incarcerated at Happy Feet in Secaucus, NJ! If Bedford was a singer, I bet he’d be a Beatles’ fan and this is the song he’d be singing. I wanna be your cat. I wanna be your cat! I WANNA BE YOUR CA-A-A-AT! Allow me to tell you a little about Bedford, who is 8 months old and very sweet and cuddly. He loves both dogs and cats and is up to date on all his shots, dewormed and housebroken. Bedford tested position for FIV which means that he has a weakened immune system. FIV is not transmissible to humans or dogs. While it is transmissible to other cats, it can only be transferred via a deep penetrating bite wound or through breeding. So FIV+ cats can live with non-FIV+ cats. For the month of June, all of their special needs kitties are available for half price of $75. If you are interested in Bedford or any of their cats and kittens, please visit http://www.happyfeet.petfinder.com/. I’m taking part in the Opt to Adopt and Blogpaws Adopt-a-Cat blog hops. Click on their names to see more entries. UPDATE: This little ghetto kitteh was actually offered a kitty referral, which I’m presuming is some sort of commission, if I send any innerested buyers to the realtor of the condos I featured Wednesday. How pawsome is that! That is one cute kitty! Maybe he could be an added attraction to that new condo?? I hope he finds a furever home very soon, CK. He is pretty adorable! Bedford is cute! And I love the Iggy nod. We are so glad that more people are now better informed about kitties with FIV (Mommy included!). Bedford is a very handsome Tabby! Hope this little cutie finds his forever family as he is so sweet. What a handsome guy! We RTd your tweet about the post to share him. Triberr is giving us acid indigestion and won't show us the posts we want to share, so we just share manually. He is such a sweetie and we sure hope he gets his happy soon. best fishes two ewe dood ya findz yur for everz home by monthz end !!! Bedford is adorable...and he sings a great song! We purr that he finds his furever home. Bedford id precious! Paws crossed he finds a home real soon! Sharing. Bedford is a sweetie. I hope he gets adopted very soon. Bedford, we hope you find a forever home very soon. Crossed paws for little Bedford! And Keisha, sweetie, just how are they paying the commission? Kitty treats? Toys? Food? You are one lucky ghetto cat!! What a sweetheart, huge purrs for him to find a safe and loving forever home. Hims vewy cute. Meez hopes hims gets a home soon.